www.photomacrography.net :: View topic - Getting 3.6x - 7.6x magnification. Getting 3.6x - 7.6x magnification. Posted: Fri Sep 11, 2009 5:04 pm Post subject: Getting 3.6x - 7.6x magnification. AS BOTTOM LEFT LENS HERE. Although designed for 160mm tube length and a magnification of 4x I tested it on my bellows setup using the 2 extremes of minimum and maximum bellows extensions. 2 setups using a Bluebottle fly. Also took a photo of a mm scale at each setup. Images are full frame, D90 sensor is 23.6 mm wide. #1 Minimum bellows extension (Nikon PB-6); frame width about 6.5 mm = 3.6x mag. #2 Maximum bellows extension; frame width about 3.1 mm = 7.6x mag. I am especially pleased with the 7.6x mag. ; it fits nicely between the 'easy to get' 4x and 10x mags. Great shots NU (as always)! On the 7.6x image, I gather that the bellows was extended about 208mm (= max according to the internet). There would be additional extension -- about 40mm or so -- from the sensor to the attachment point of camera & bellows, plus more -- between end of bellows & base of objective. Do you have a figure for this total distance? Must be a lot; I'm amazed that the objective does such really nice job of resolving this extra distance... Also does a great job of resolving the 3.6x image at a distance which much be less that the 'required' 160mm. I'm amazed that the objective does such really nice job of resolving this extra distance... Also does a great job of resolving the 3.6x image at a distance which much be less that the 'required' 160mm. The reason this works so well is that the objective has a small numerical aperture, NA = 0.13. The graph HERE shows "Tolerance to tube length change versus object N.A." You can see that for NA = 0.13, there's essentially infinite tolerance. The caveat is that "tolerance" refers only to spherical correction (if I recall correctly), but according to the microscopy books, that's the major aberration that kicks in as you change tube length. Of course there are other things that can go wrong, notably 1) coverage may become smaller than your sensor if you make the tube too short, and 2) if the tube is too long, you'll get empty magnification because of diffraction. For diffraction, a 4X NA 0.13 objective operating at 4X is about equivalent to a nominal f/3.1 lens also operating at 4X. Based on the aperture, I'd expect this objective to give resolution someplace between my 38 mm f/2.8 and 20 mm f/2.0 Olympus bellows lenses. (The Olympus lenses have pupillary magnification factors that makes them act smaller than their nominal ratings. The f/2.8 acts more like f/3.5.) So the advantage of the Olympus lenses is that they have adjustable apertures; the disadvantage is that each of them probably cost a bunch more than the Nikon objective did. WD is quoted as 16.22 at 4x, so it obviously isn't a "simple lens", which we would have guessed, to make it parfocal 45. I don't agree. 1/(2*NA) gives the effective f-number on the object side, so 1/(2*0.13) = 3.84. From that, you have to compute the nominal f-number. f_effective = f_nominal*(m'+1), but from the object side, m' = 1/4. Hence f_effective = f_nominal*(1/4+1), so 3.84 = f_nominal*(1/4+1), f_nominal = 3.84/(1/4+1) = 3.08. I rounded to 3.1. 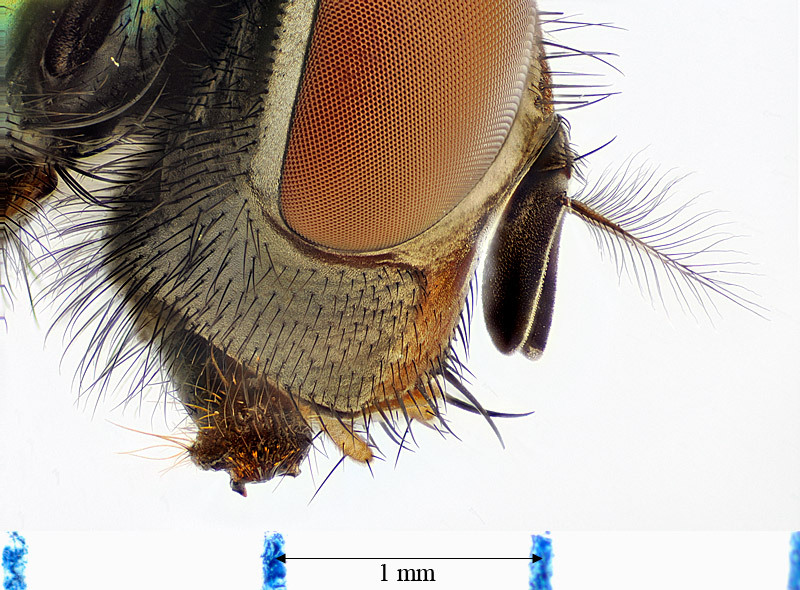 In general, using thin lens approximation, a microscope objective operating at magnification m onto the sensor will be equivalent to f_nominal = 1/(2*NA)*(m/(m+1)). Your formula is close, it just has 4+0.13 sitting in where it should be 4+1. If anybody really cares about the focal length, I suggest using the method described HERE, that FL = (difference of extensions) / (difference of magnifications). If anybody knows the max & min extensions of NU's bellows, FL can be computed from the scale bars he shows, combined with his sensor size. This article is relevant too, but I can't remember where I downloaded it from.. Anyone recognise it? Impressive! It's a shame about the little area of flare/halo between the face and the antenna. Lovely lighting. How did you light the subject NU? At minimum extension, distance is 140mm +/- 2mm. Harold I can't account for the flare, lens itself looks clear. 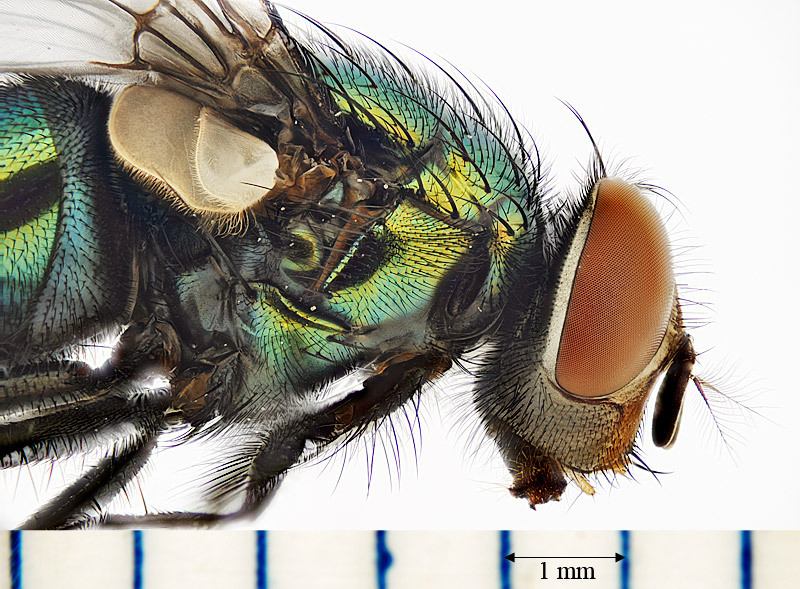 It's on both shots and so is perhaps some high reflectance from the face of the fly. Dave White chicken egg diffuser (seems nobody sells Ping Pong Balls in NB) and 3 Nikon SB-R200 flashes. Image distance 150, object distance 16.2, FL 40, Mag 4. ?? Iimage distance "should" be 200 for a simple lens. Does this mean the exit pupil is about 45 mm in front of the lens flange? Not really, I'm just curious. I'll go back to my knitting. Thanks for the figures NU. Your Hong Kong purchase looks to have been an excellent buy! I think the flare seen on the backside of the antenna does come from the bright face: as the ultimate image is compiled during stacking, a 'ghost' halo of brightness builds-up against the adjacent dark antenna -- due to the slight shifting that occurs from one image to the other. Lenses have interesting behavior, don't they? An excellent way of thinking about them is the "thick lens model". Thick lenses act like thin lenses, except that you have to measure the lens-to-object and lens-to-image distances from two different places called the "principal planes". What's happening with this lens is that the principal planes are "crossed", meaning that the one used for lens-to-object distances is actually closer to the image than the one used for lens-to-image distances. See discussion HERE. Now that we know the FL, it's easy to locate the principal planes by measuring from the object and the image. Suppose the lens is 40 mm FL and gives 4X when placed on a 150 mm tube. The combination of these facts means that the distance from image to "rear" principal plane is 40*(4+1) = 200 mm, while the distance from object to "front" principal plane is 40*(1/4+1) = 50 mm. Because the lens is parfocal at 45 mm in front of the lens flange on a 160 mm tube (150 mm from eyepiece focal plane to lens flange), we then have that the "front" principal plane is 5 mm behind the flange and the "rear" principal plane is 50 mm in front of the flange (5 mm behind the object at 4X!). Locations of the principal planes are determined only by the refracting surfaces, and they stay in fixed positions with respect to the lens as you change the lens-to-object and lens-to-image distances to get various magnifications. So if you're a connoisseur of calculation, you can use the FL and the positions of the principal planes to determine without further experiment where things would have to be in order to get any specific magnification. Parfocality of the lens at 45 mm is certainly not a coincidence. 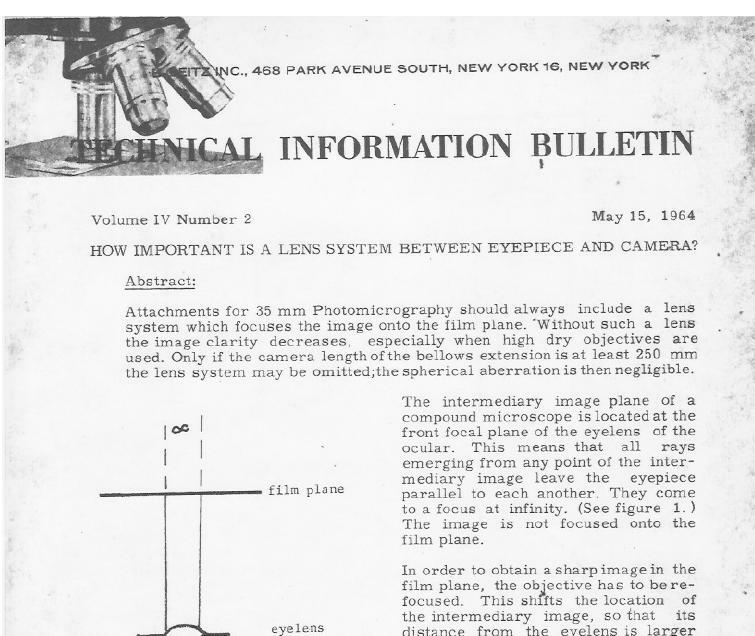 That was a design requirement for the lens, and the lens designer met it by cleverly figuring out combinations of refracting surfaces that would combine to give the required FL and principal plane placements. As for positions of the entrance and exit pupils, well, that topic is even murkier. Suffice to say that knowing where the principal planes are tells you essentially nothing about where the pupils are. There are lots of writeups from respected sources that say the pupils are located at the principal planes. Those writeups are misleading at best and completely wrong at worst. For some purposes, you can pretend that the pupils are located at the principal planes and get the right result. For other purposes, taking that approach gives completely the wrong result , by which I mean that the result predicted by calculation disagrees wildly with the result observed by experiment. The entrance pupil is simply wherever the aperture appears to be, looking through whatever lens elements are between it and the subject. Depending on placement of the physical aperture within or even outside the lens, the entrance pupil can be moved from infinity behind the camera, to within the lens, to in front of the lens, to even behind the subject. The latter situation gives inverted perspective -- things closer to the lens look smaller! Not really, I'm just curious. Me too. Curious is good. Every once in a while you find out where Mom keeps the cookies hidden. Looks like a "keeper". Excellent shots. It would be interesting to see how it compares with the 40/2.8 Apo Componon HM with an f4 Waterhouse stop in place. They should be pretty close in focal length.